Like Isak Dinesen, I too wanted to see the face of Africa from the air. For the occasion, I even donned a taupe linen duster, the voluminous hem catching on my boots as we boarded the twin engine air craft at Wilson airport. 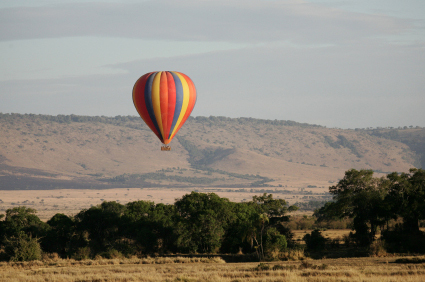 The flight over the Rift Valley and to the Masai Mara surely must be one of the most beautiful in the world. I did not go so far as to feel that it was “My Africa”, but my eyes did well-up with tears when I first saw the expanse of the Mara – it was everything I had dreamed of: open landscapes, endless skies, elephants in scattered herds moving beneath us and, of course, through the roar of the engine, the haunting theme song from the film Out of Africa kept playing in my head. 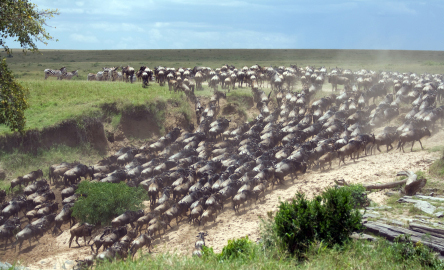 Like every tourist who has gone before us, we had not only come to see the wildlife but to witness the migration of the wildebeest, that “last wildlife spectacle on earth.” I never stopped to think that the primeval stampede, the dramatic crossing at the Mara River, would not perform on schedule. One does not have appointments with wildlife. Little did I know how elusive this spectacle can be. The exact route and time of the migration changes from year to year, the pattern dictated by rainfall. 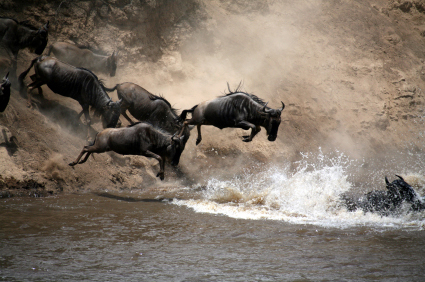 The wildebeest (or white-bearded gnu) is the ungainly, short-legged, hoofed antelope that bellows like a cow. They are forever nomadic, traveling clockwise from their ancestral home in the Serengeti to the flat plains of the Masai Mara. The animals are propelled by the sound of distant thunder and the hope of finding greener pastures in an endless and precarious cycle of birth, life and death. 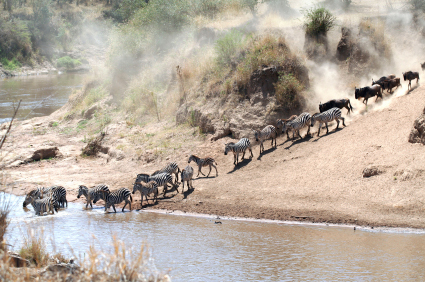 The behavior of the wildebeest is inexplicable, often tragic. 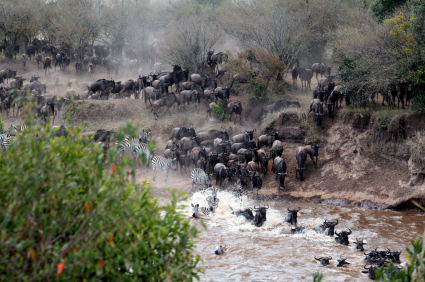 They travel in vast herds finding safety in numbers yet thousands meets their death every year during the migration. Like lemmings, they line up on the river bank where they hesitate in blind terror, postponing the inevitable, until they are finally pushed over the edge by the brute force of the animals stacked up behind them. Pandemonium ensues: some of the animals are swept away by currents; others trapped in the massive jaws of crocodiles while hundreds of beautiful black-faced calves are separated from their mothers and drowned. Not that we witnessed any of this. At the Mara River, where we had hoped to witness a ‘crossing’, we found instead a placid scene of submerged hippos and languid crocs sunning on its shores. Our driver, anxious to oblige, drove on in the pale glow of the morning’s sunrise, to find what seemed like a small army of wildebeest. We literally drove right through them as they parted way to let us pass, closing ranks behind us. The driver turned off the motor and we sat in silent awe encircled by hundreds, perhaps thousands of grazing wildebeest, listening to the constant chorus of their lowing sound. The herd stretched as far as the eye could see. 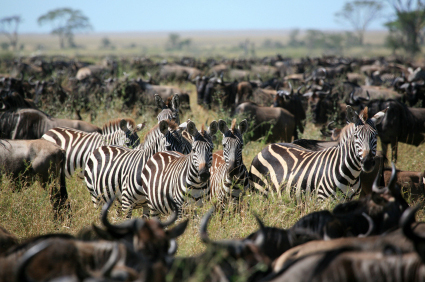 Zebra intermingled with the wildebeest, their collective stripes casting a silver sheen, an occasional wildebeest, flinging its black mane, would perform a frolicking kind of jig, no wonder they are considered comical. Hyenas and Egyptian vultures skirted the periphery in wait. On the distant plain, we could see a hot- air balloon rising majestically with the sun, its long shadow traversing across the Mara… we were in Africa. A few weeks later, while lunching at a friend’s home on the outskirts of the Nairobi game park, we were interrupted by what we thought was the sound of thunder - realizing only too soon - that it was the sound of thundering hooves. It seemed the earth moved beneath us. To our surprise, at the top of a nearby embankment we witnessed a small herd of wildebeest gathering precariously at the edge. Suddenly the herd moved en masse stampeding against the face of the steep bank, hundreds of hooves flailing, as they plunged instinctively into the narrow river below. Through the rising dust and the plaintiff cries, we could see that some of the herd had managed to scramble to the other embankment while others, less fortunate, suffocated in the stampede or were drowned in the swirling waters. We were rendered speechless by this pitiful, impressive sight - this unscheduled dance with death.